Raiders of the Lost Ark is a 1981 action adventure film directed by Steven Spielberg and is the first instalment in the popular Indiana Jones franchise. 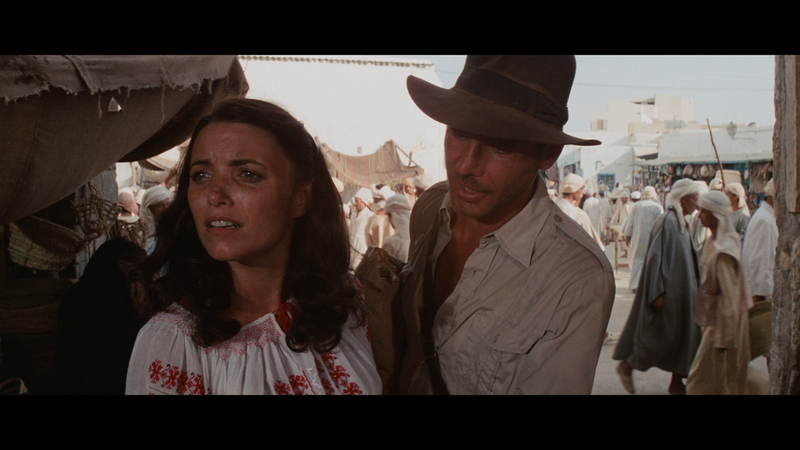 Starring Harrison Ford with Karen Allen and Paul Freeman the movie follows archaeologist Indiana Jones in a bid to retrieve the Ark of the Covenant with competition from the Nazis who believe its powers will make thier army invicible. The now iconic character was created by George Lucas many years before arriving on the big screen and was inspired by numerous old film serials of which Lucas was a fan. 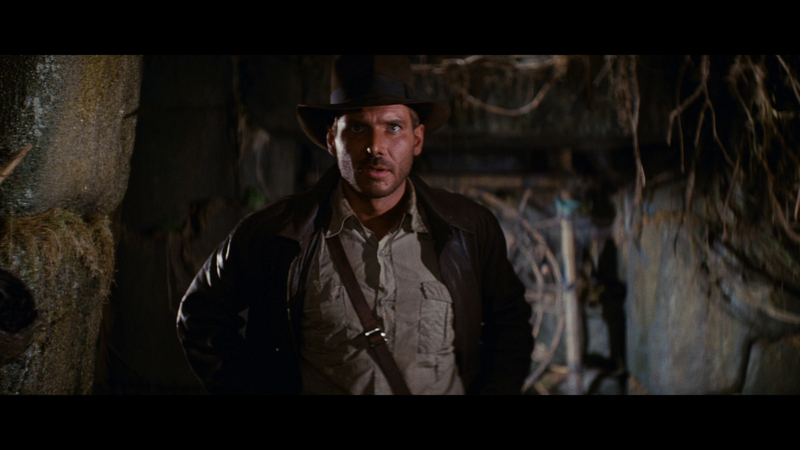 After the release of Star Wars in 1977 Lucas and fellow director Steven Spielberg were discussing future projects and the idea which became Raiders of the Lost Ark blossomed based on the character Indiana Smith who was named after a dog owned by Lucas. Spielberg's dislike of the Smith surname would ultimately lead to the birth of one of the most famous characters in movie history. Indiana Jones. In early 1978 Lucas and Spielberg brainstormed ideas and fleshed out the story which was transformed from a story treatment in to a feature length screenplay written by Lawrence Kasdan. The part of Indiana Jones was originally offered to actor Tom Selleck who was unable to sign for the picture due to his commitments on Magnum P.I. 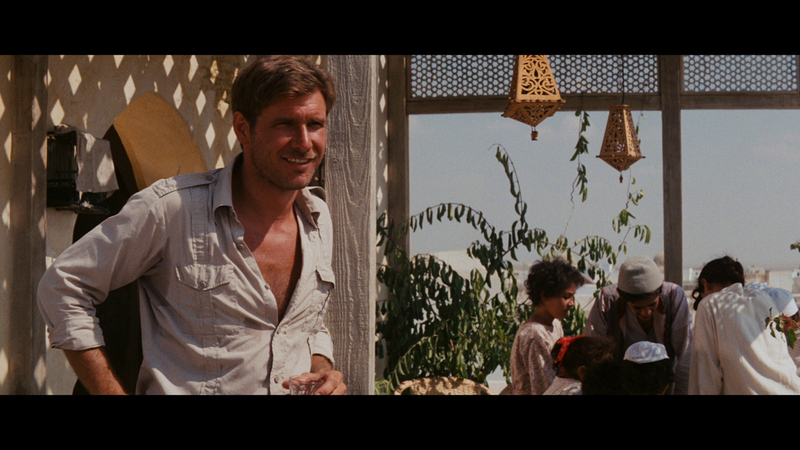 and despite an initial reluctance Harrison Ford was cast in the role. Filming commenced in June 1980 and on June 12 1981 Raiders of the Lost Ark was released to worldwide critical acclaim, grossing over $400 million at the box office and nominated for nine Academy Awards the picture spawned an entertainment franchise which includes the 1984 prequel Indiana Jones and the Temple of Doom and the 1989 sequel Indiana Jones and the Last Crusade. 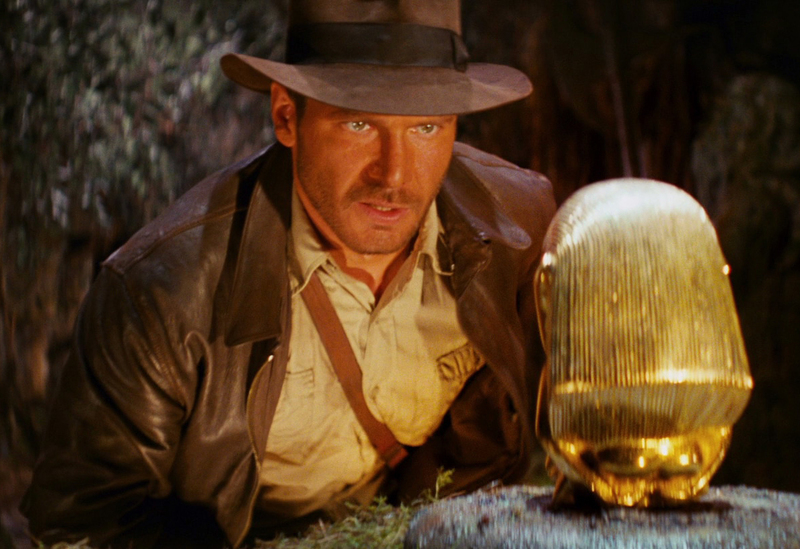 The famous character would return to the big screen almost twenty years later in Indiana Jones and the Kingdom of the Crystal Skull cementing his place as one of the most enduring and recognisable of all time. 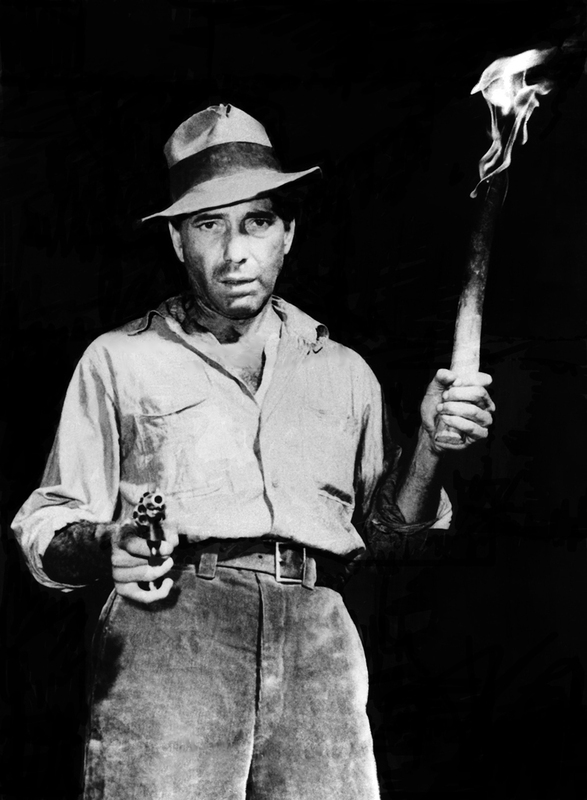 An important part of Indy's character is his dress, his now iconic look was visioned by Lucas from varying sources which would include Charlton Heston's portrayal of Harry Steele in Secret of the Incas (1954) and Humphrey Bogart's portrayal of Fred C. Dobbs in The Treasure of the Sierra Madre (1948). 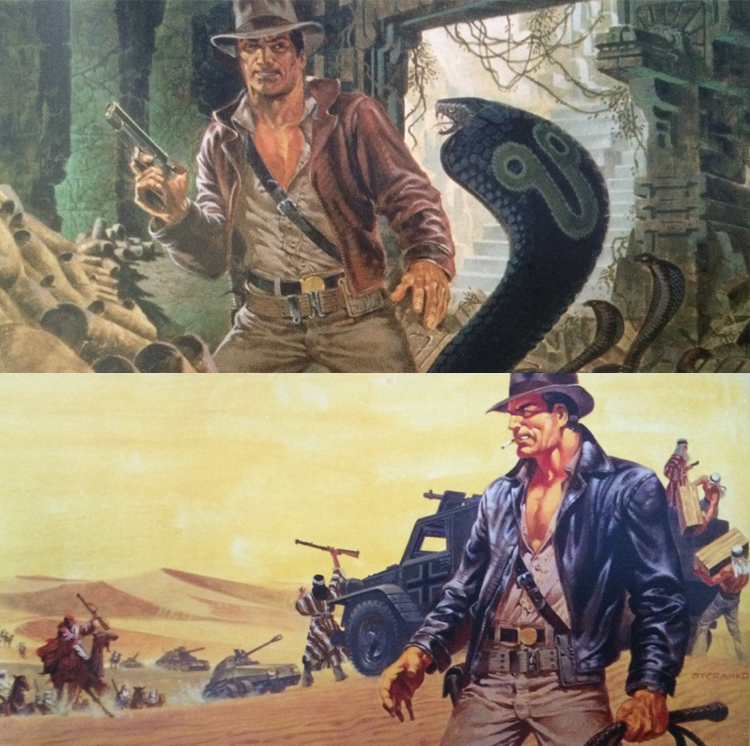 During pre production Lucas hired noted artist and illustrator Jim Steranko to create some conceptual paintings which would cement the image of the character with his fedora, bullwhip and leather jacket, a look which was later refined by costume designers Deborah Nadoolman and Kelly Kimball giving it a more battered and lived in appearance. 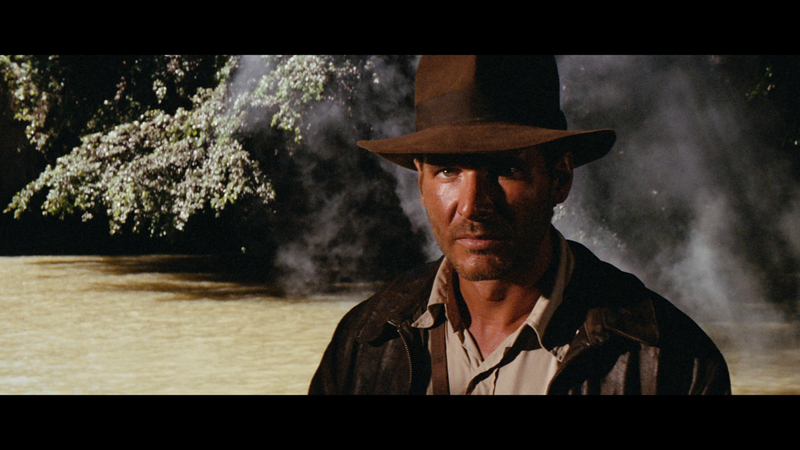 The various elements of Indy's costume were sourced from numerous places for the production of Raiders of the Lost Ark, these sources are often the subject of debate by enthusiasts and replicators of the costume alike. 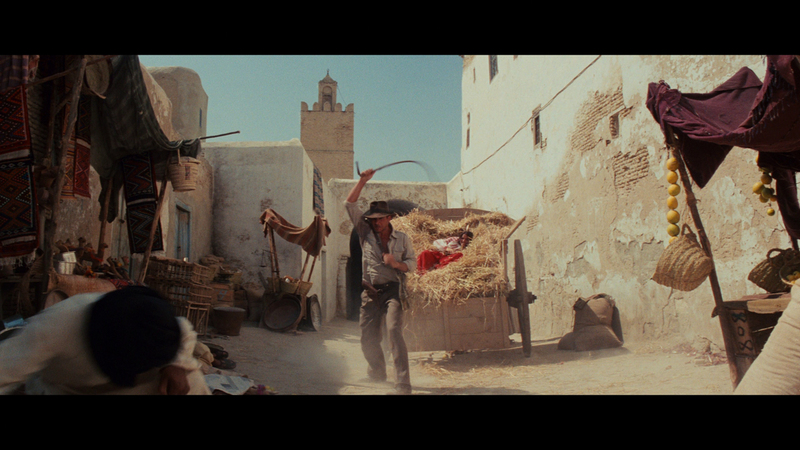 Some of the items could simply be found, the fedoras were obtained from noted London hatters Herbert Johnson with the bullwhips constructed by David Morgan, the important clothing elements however, the jacket, shirt and pants, were bespoke tailored for Harrison Ford. 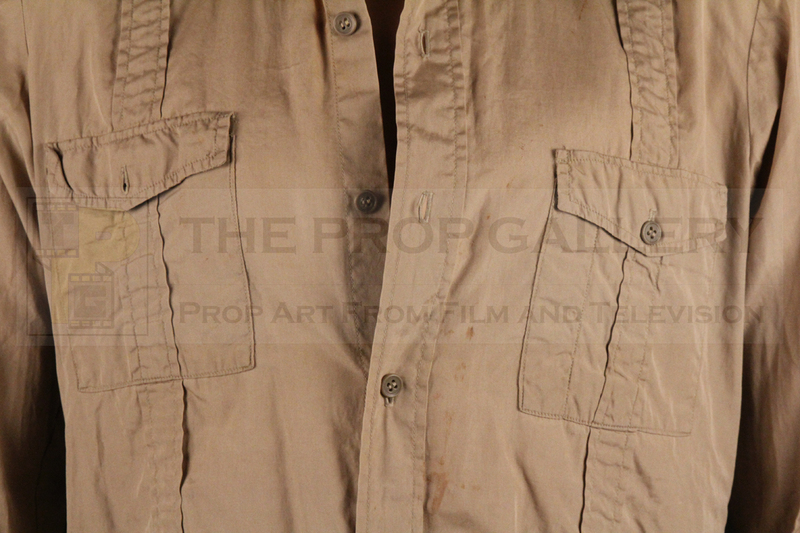 This shirt is an original worn by Harrison Ford as Indiana Jones during the production of Raiders of the Lost Ark. 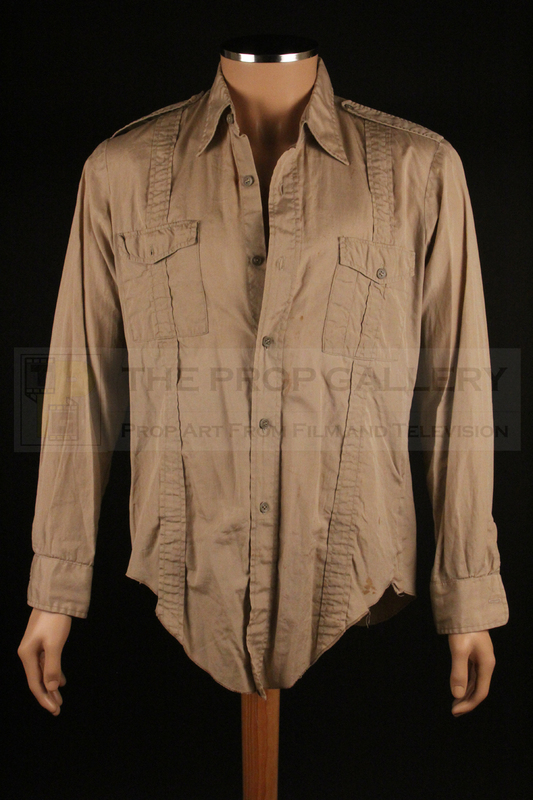 Created for the production by prolific industry costumiers Western Costume the tan coloured safari style shirt features distinctive pleats running from the shoulder to tail and is the only style of shirt worn by Indy as part of his signature costume throughout his adventures, a recognisable costume element in its own right given that the character so often appears without his jacket in just a shirt and pants. 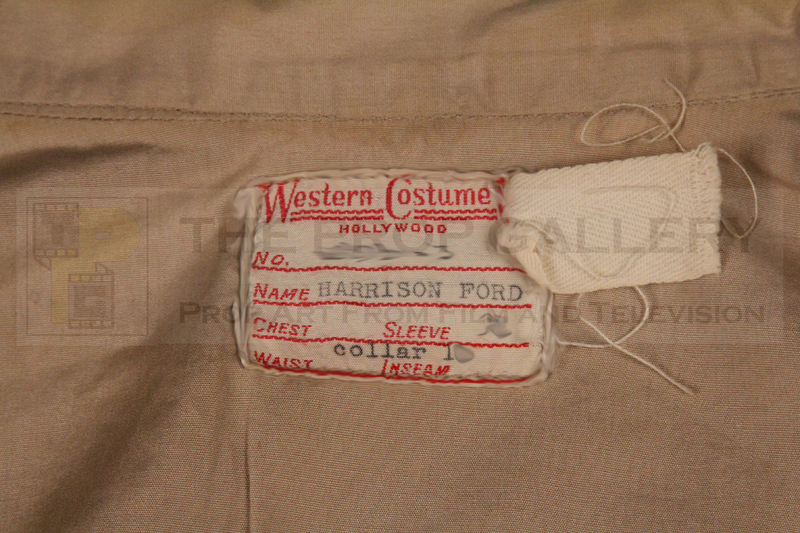 To the interior the shirt bears its original Western Costume wardrobe label which is type written with Harrison Ford's name, collar and sleeve size in addition to the Raiders of the Lost Ark production number (please note in the image below elements of the label have been blurred to prevent replication) and a further tag with illegible writing. 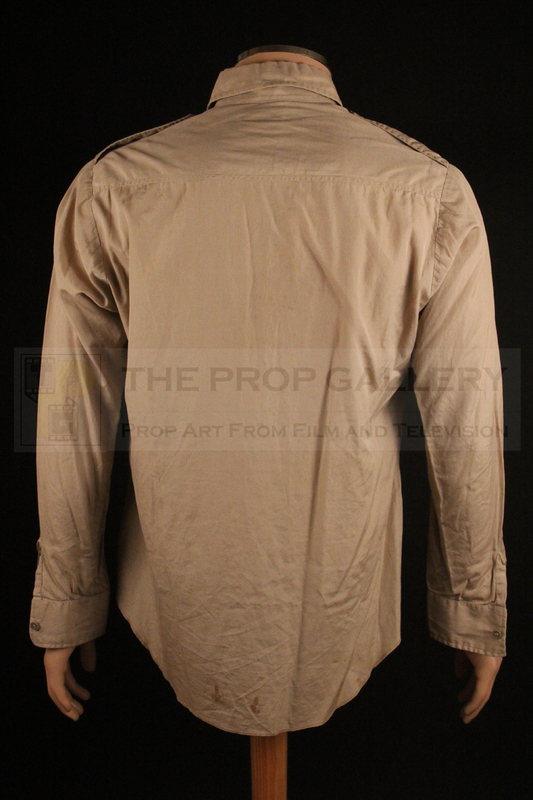 The shirt remains in generally excellent but well used condition throughout with some light staining and small repair to minor damage which occurred during the production. 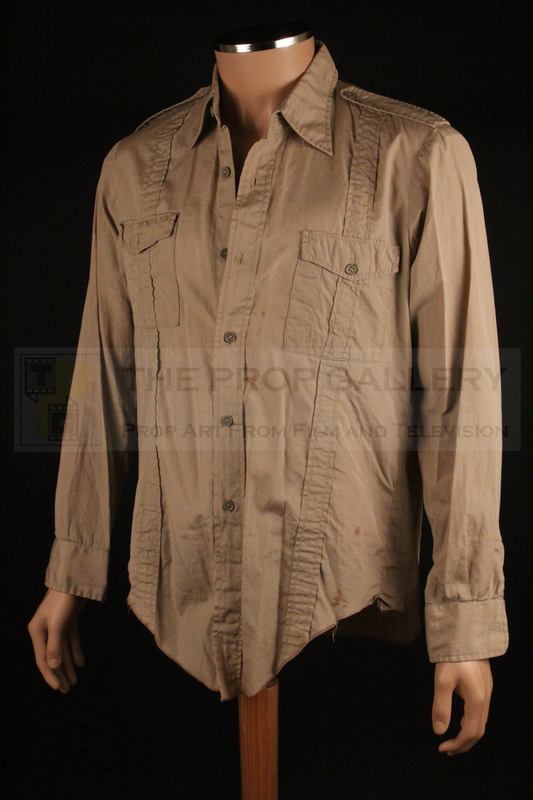 This particular shirt can be screen matched to one worn by Harrison Ford in multiple scenes of the movie, notably by a slight, but noticeable, defect in the construction which can be conclusively matched up on screen. 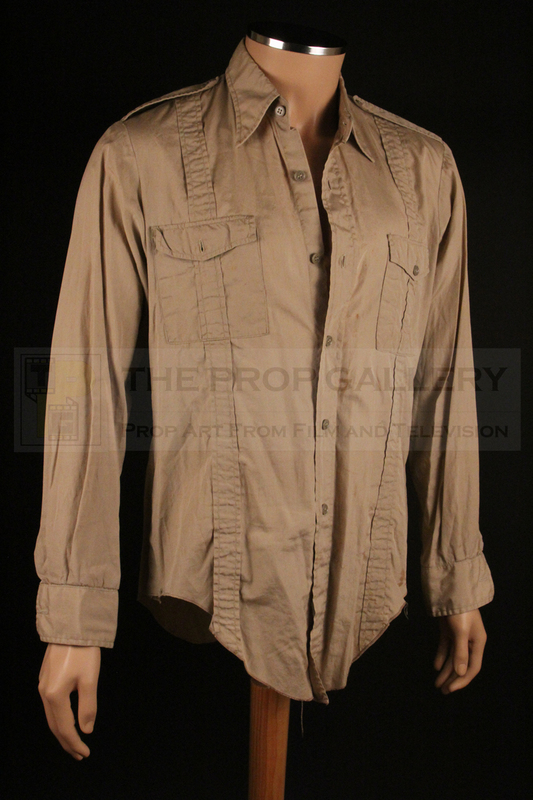 Original material from Raiders of the Lost Ark is incredibly rare and this shirt represents a fantastic example of signature Indiana Jones costume which can be guaranteed to have been worn on screen by Harrison Ford in one of his most famous and memorable roles. 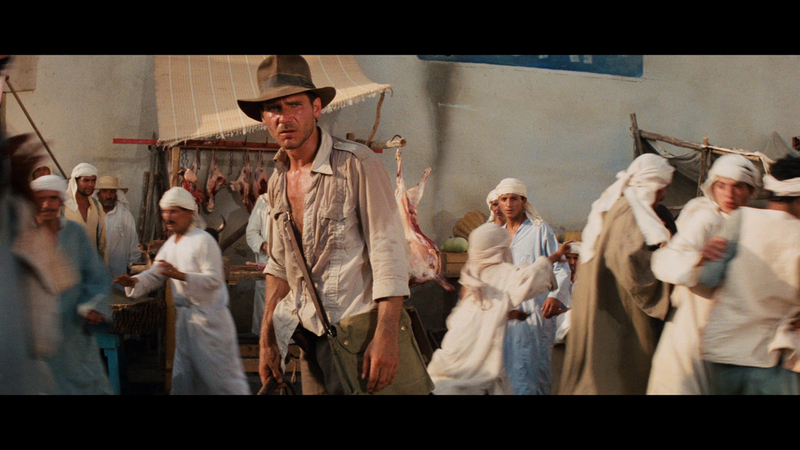 Raiders of the Lost Ark is generally considered by fans and critics alike as the finest of Indy's adventures and will forever be fondly remembered for its unforgettable opening sequence which introduced this iconic and lovable character to the world.